A cool paper this week, written by long-time collaborator, Nicolas F. Martin. 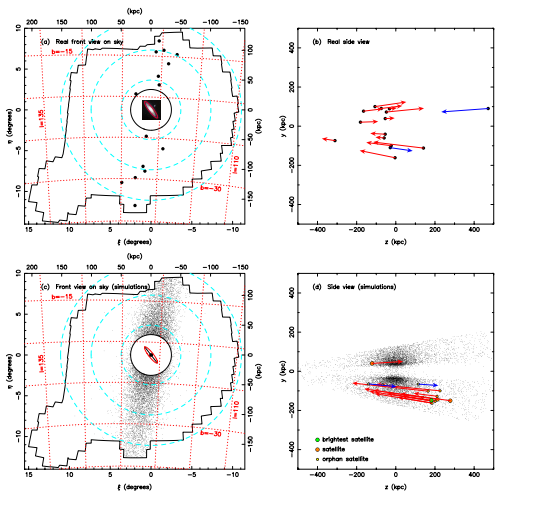 Again, it's a PAndAS paper but the focus is not Andromeda but our very own Milky Way. How, I hear you say. The Sloan Survey had many goals, but one of those was to look at the stars in our own Galaxy, especially in the Galactic Halo. If our picture of how galaxies form and grow are correct, basically by eating smaller systems, we should expect the halo to be full of the debris from things being consumed at the present time. And this is what we see in the Field of Streams. So, a tiny post today. Here's a picture from the BBC story. This is supposed to be the Big Bang, with galaxies rushing from a central explosion. 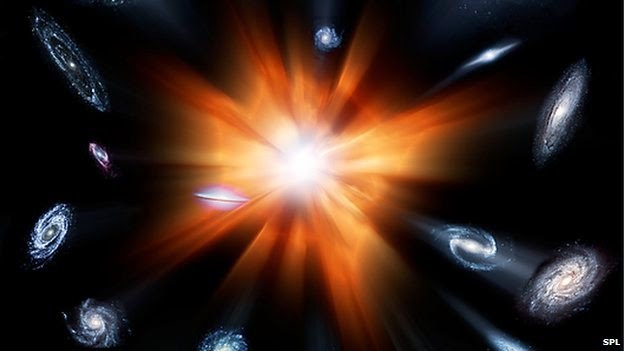 I've written about this before, but this is not what the Big Bang was. It was not an explosion in preexisting space. If we take the cosmological parameters as we currently know then (and assume a simple topology) then the Universe is now infinite in extent. And it was a billion years ago, and it was 13.5 billion years ago, and it was throughout the history of the Universe. I am going to avoid the breathless headlines doing the rounds about an upcoming press release about the detection of cosmological gravitational waves. Firstly, a press release about an upcoming press release is a seriously poor way to do science. And I am already groaning internally about how poorly any result will be presented in the media (looking at you ABC News 24, especially Michael Rowland, who still calls the Higgs boson the Higgs bosun). So, back to something we all enjoy, America bashing (every year I eagerly await the letters in the newspapers complaining about halloween in Australia, telling us that we don't want this American rubbish here while chewing down on a McDonalds, sipping coke and driving a ford, stopping at the American stop sign before rushing home to watch the latest American cop show on TV). And before any American readers get riled up, the preceding text is an example of sarcasm. Before we start, well done to the Running Astronomer on her most recent race. Papers are like buses. Well, their not really, but hot on the heels of yesterdays cosmology paper, another paper on the arxiv, this time with the friendly title of A thousand shadows of Andromeda: rotating planes of satellites in the Millennium-II cosmological simulation. This is a cool paper and harks back to our discovery last year of the discovery of a strange corotating plane of satellites in the Andromeda Galaxy. Well, here we are more than a year later, and there is still no satisfactory answer to what it is doing there (or the equally strange, and badly named, Vast Polar Structure of the Milky Way). Over the last few decades, we've built up a complex model for the formation and evolution of structure in the Universe, and the favourite picture, know as ΛCDM, works extremely well on large scales. Ultra-quick post today, but a new paper on The Arxiv. The title is "Non-linear Chaplygin Gas Cosmologies", catchy eh! But what does it mean? Essentially, we have two big dark mysteries in the universe, dark matter and dark energy, and what we want to do is try and reduce the number of mysteries by a factor of two. We can do this with a Chaplygin gas, modifying its usual properties so that on small scales it looks like dark matter, while on large scales it acts as dark energy. In this first paper, we basically lay out our new model, led by Pedro Avelino who was visiting the Sydney Institute for Astronomy from Portugal. It's a bit mathematical, but in coming papers we will detail a number of observational tests we compare the model to. That is yet to come, and I will write a lot more detail then, but I have to run. Before I go, I'll note that this is my first paper with Krzysztof Bolejko, and so my Erdos Number has significantly shrunk. More on that too!